Today I enjoyed a nice steaming bowl (albeit a styrofoam one) of fish ball noodle soup at a little stall next to the Hong Kong Market on Colima in the city of Rowland Heights. It's immediately located to the left of the supermarket, in the alley where the ghostly stench of stinky tofu haunts the air. The family that owns this shack serves good, comforting, simple, and inexpensive noodle soups and snacks, in what is literally a walk-up window, where I have stoop to place my order. In a jiffy, the noodle soups were ready, along with a side order of fried calamari. We took the meal under the shade of umbrellas, where we slurped on the noodles and sipped hot soup, as the cold January breeze nipped at our necks. What better to warm us to the core than these supple white rice noodle ribbons in a clear, sweet, and salty broth with bits of preserved vegetable for flavor, bean sprouts for crunch, steamed shrimp, and five round, chewy fish balls which bobbed like buoys. We also enjoyed the calamari rings, deep fried in a light, golden batter, served over a bed of pickled veggies and a side of sweet 'n sour dipping sauce. 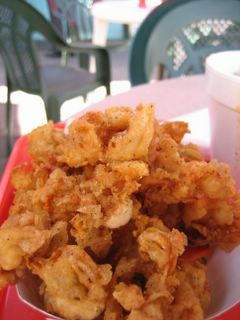 These curly Q's of squid were addictive, dastardly crunchy, and the perfect compliment to our noodle soups. The cost for our soul-warming, gut-filling meal? $2.75 per bowl for the noodle soup and $2.50 for the fried calamari. I had enough cash left over to buy a cold, iced, tapioca milk tea afterwards from the Lollicup stand inside the market. What better way to make our core temperatures plummet back down? It sure wasn't stopping anybody. Definitely - this place is authentic, and most important...good and cheap. I didn't check the rating. But it was certainly getting a lot of business yesterday. The cold weather helped! There are times when I envy you all in SoCal. Phoenix is probably not a haven for soup stalls as it barely dips into the "frosty" region but once or twice a year. However, we are in the middle of that cold spell that attacked us from California and a big bowl of authentic Chinese soup would have been a godsend today. Great review as usual, elmo. Hmm, that makes sense that Phoenix wouldn't have many soup stalls. Never thought of that before! What's funny is that the boba drink cost only a dollar less than my bowl of noodle soup! WOW, that is one food stand that I desperately need to try! 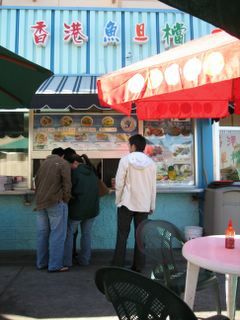 Next time I run down to Southern California, I am definitely stopping by the Fishball House. Cheap foods can be extraordinarily gratifying. For instance, after a grueling shopping session at Costco and IKEA, I always grab one of those greasy hot dogs that have been cooking under the glowing heat lamps--and oh man, those hits the spot! 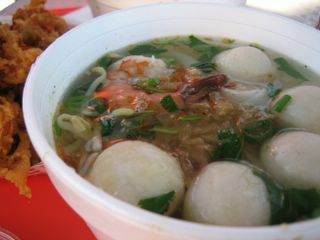 Sounds like the Fishball House hits the spot too! Whoops, I too excited in my last post. I mean "those HIT the spot." You crack me up! I'm also a perfectionist when it comes to grammar and writing. I cringe whenever I see myself making a rookie mistake. I sometimes edit a post ten times before I leave it alone. So no worries! I don't mind you posting as many comments as you'd like until you feel it's right! HAHA! whoa, you peaked your head out of the orange curtain. i'm gonna try this place soon. try the place 3-4 stores down to the left - they have pretty good stinky tofu if you're into that. i love that stuff. Yup! I bust out of O.C. once in a while. Sometimes you just gotta see how the other side lives (and eats), ya know?! Oh yeah, I think that stinky tofu place you mention is gone now. It's a place I could hardly forget, and when I came back on this visit, the restaurant was boarded up. Although, interestingly enough, the smell of stinky tofu still lingers. Now that's potent stuff! Actually, the stinky tofu place is still there. They just moved to a few stores down of Fishball House. WOW! Can't find prices like those anymore! Ah! So that's probably what the Chinese characters posted on the shuttered doors said...and this explains why I can still smell the stinky tofu. Thanks for the info! wow....thats is down the street, and let me tell you- sometimes that stench is like whooooooo, but good food nonetheless. it's so awesome to find that someone write about something down the street. kinda creepy in a small-world type of feeling. Finally went to this place as I was finally in the area. The whole mall smells like a sewer and not a single place had a rating over a B. There was this pet store selling puppy mill puppies and they were in the hot sun on a hot day in these tiny cages. So Sad. It wasnt bad, but nothing great. Not a lot of flavor in the soup or fish balls. The fried calamari thing was good. It had a crispines that really stood out. But due to the all the other things I mentioned, it just wasnt good enough to return or repeat. Are you sure that was the sewer you were smelling? I think it just might be the stinky tofu place a few doors down. That stuff smells like rotting human effluence!